Rev up your favourite chair and come with me to revisit my latest trip to Mexico... land of beaches, jungle, strange flora and fauna, excellent people, mariachis, tequila, food, and so much more! Unlike Greyhound buses in the United States, Mexican buses play movies. I saw Ratatouille twice before my bus pulled into Puerto Vallarta, and I would see it again. It was late and I was exhausted. This would be my first night in a bed since leaving Vancouver. After trudging a few blocks, I found a hotel on the beach, paid for it, and went upstairs to bed. Alas, the bed had black hairs on the sheets and the blanket had bugs under it. The night clerk would not refund my money because the owner had gone home. So I left. Eventually I found a fabulous little hotel several blocks further up from the beach. 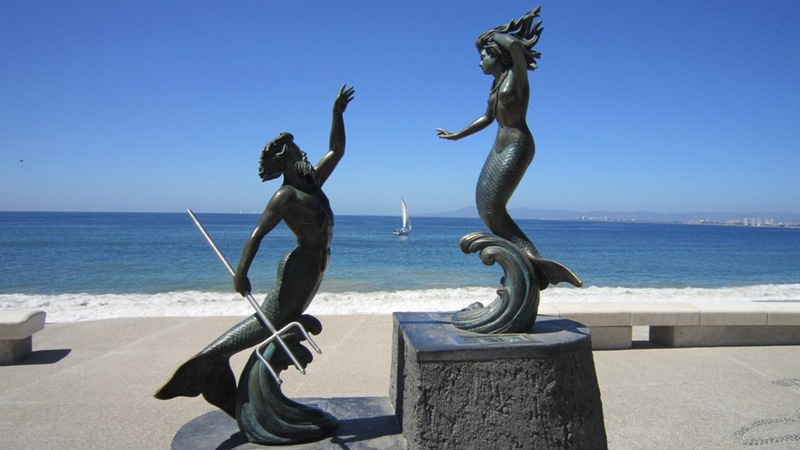 In the morning, the clerk suggested that I make a complaint to the Puerto Vallarta Tourism Board office on the Malecon. And so I found myself in front of one very concerned official who called the errant hotel owner, chastised him, and instructed him to refund my money! Somewhat embarassed, I received a refund from the owner. Lesson learned. Always ask to take a look at the room before you pay for it. This new hotel was wonderful... clean, quiet, and pleasant. My room had a tiny balcony overlooking the street and it would have been perfect to sip a beer and chill out while watching the local activity, but alcohol was not permitted on the premises. What can I say about Puerto Vallarta? It has changed! The hotel my aunt and uncle stayed at every year for 30 years had been transformed into a boutique hotel and trendy bar. Charming? Yes, still. Amazing bronze sculptures now line the beachfront Malecon which barely existed when Richard, I, and 200 or so other tourists ~ local and foreign ~ spent the night on the beach, guarded by police with machine guns, because all the hotels were full. Could Barra de Navidad possibly live up to the hype from my friends who had been there? Could it live up to my impossibly high cleanliness standards? Would I have the courage to swim in the ocean there? After yet another viewing of Ratatouille on the bus to Barra, I arrived. It’s a small town with sandy streets and at least one extremely dangerous sidewalk. Beware! While traipsing around Barra with my backpack on, I unwittingly stepped over the edge of a 15-inch drop in the sidewalk and fell hard onto my side. As a result of this fall, I had a huge bruise down the entire side of my body for six months. It could have been worse. What if I was elderly? If such an accident had happened in Canada, a municipality would be sued... but this was Mexico. I rented a room in a rustic hotel which was recommended to me by a friend in Vancouver. Gone were the classic wall hooks to sling hammocks from. It was simple and clean. It was also inhabited by 3-inch, slow-moving cockroaches. I plugged the drain. No more cockroaches. The beach at Barra is somewhat hidden behind beachfront hotels and private homes. It’s very pretty, especially at sunset. Around that time, a vendor appears with fresh homemade pies. Barra is truly charming in the evening. People were swimming and they appeared to be having fun, but I had done my research and I wanted to leave Mexico by bus, not air ambulance. From what I’ve read, the pollution is related to a combination of poor planning, poor building practices, and corruption. A month later, on the bus back to Tijuana, I saw a landscape knee-deep with plastic litter as far as the horizon, and for hundreds of miles of highway. I lost my courage and decided against swimming. Maybe another day. Instead, I took a stroll down one of the main sidewalks, still feeling sore and ornery after my fall. In the distance, I noticed a woman in a bright fuschia dress heading in my direction, her bright red curls bouncing as she wobbled a bit on her stiletto sandals. Thrilled to encounter someone who might speak English, I moved to greet her. She said, “Oh, hi Gale.” I offered, “Uhhhhhh... ” She said, “Don’t you remember me? I’m Nan, Sherry’s friend. I came to look at your house once, to rent a room from you. Instead, I left for Mexico and I’ve been living here ever since. That was years ago.” Nan invited me to stay, as her paying guest, at a beachfront resort she was managing at that time, Casa de Marco, and now owns. It was luxurious and heavenly! Personally, I did not find Barra as amazing as most people do. It’s cute. The hotels are inexpensive. The restaurants are good. There is very little traffic. It’s easy to explore the compact town centre. The locals are very friendly. I took a local bus into Melaque, the town next door to Barra de Navidad. I walked around and didn't see any foreign tourists. I ended up at a small restaurant on the beach, eating fresh butterflied and breaded grilled prawns with homemade French fries while drinking a cool beer in the gentle ocean breeze. It was heavenly. Nan drove us to Tentacita, a small town on a gorgeous beach. Hesitantly, I stuck my foot in the water. I went out a bit further and then chickened out. We ate at a beachfront restaurant run by a European couple. We were both sick for at least 24 hours after that. Check out these links on the state of Mexico’s beaches. You may have to use a translation plug-in.